Çavuşoğlu said that he is in contact with German Foreign Minister Sigmar Gabriel to solve differences of opinion. 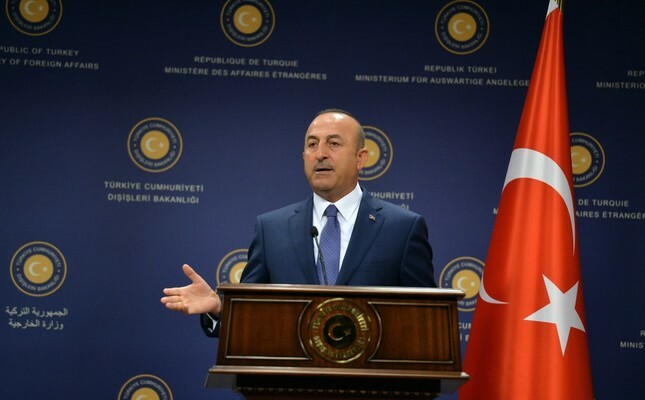 Foreign Minister Mevlüt Çavuşoğlu stressed the necessity of removing double standards imposed on Turkey to turn a new page in ties with Germany. Speaking to the Türkiye daily, Çavuşoğlu commented on Turkey's sour relations with EU member states, especially Germany. "Unfortunately, some European governments fall under the influence of some spheres advocating racist, Islamophobic and Turkophobic remarks. These countries openly presented a one-sided attitude ahead of Turkey's April 16 referendum. This attitude caused great sensitivity among the Turkish public and harmed their trust," Çavuşoğlu said. During the campaign for Turkey's constitutional referendum, the attitudes of some European countries, such as Germany and Austria, were subject to criticism in Turkey. While meetings in support of the referendum and rallies by Turkish ministers were banned by German officials on the basis that they were carrying Turkey's domestic politics into Germany, open and extensive propaganda for the opposition campaign was conducted. Some media outlets and German politicians urged Turkish citizens to vote against the constitutional reforms. German newspaper Bild published an article claiming that Mustafa Kemal Atatürk would've voted against the referendum. Ankara considered this interference in its domestic politics to alter people's votes. Çavuşoğlu also asserted that there have recently been some artificial efforts to escalate tension between the two countries because of the approaching general elections in Germany. He contended that Ankara is open to dialogue to solve the problems with Berlin. "Our relationship with Germany is valuable for us. We are in contact with my counterpart, Sigmar Gabriel, to solve our differences of opinion on a structural basis. However, first and foremost, double standards should be lifted to normalize relations and regain the people's trust," Çavuşoğlu said. Following tensions over the referendum campaign, relations between Germany and Turkey were strained again in June after Ankara refused German lawmakers access to their soldiers stationed at İncirlik Air Base in the southern province of Adana. Upon the İncirlik row German parliament voted to withdraw its Tornado aircraft and troops from the base and relocate them to a base in Jordan. German lawmakers recently demanded a visit to their soldiers at a NATO air base in the central province of Konya where German troops are stationed as part of NATO operations. With efforts from NATO, Ankara confirmed that it would allow a German parliamentary delegation to visit the base under the supervision of a senior NATO official. Commenting on the German lawmakers' visit, President Recep Tayyip Erdoğan said on Friday: "We showed a positive attitude to Germany's demand in line with our talks with NATO. This is not the İncirlik case, this is a different one. Our Defense Ministry and Foreign Ministry have been working on the process." The German delegation is expected to visit the Konya base on Sept. 8. Turkish officials stressed that German lawmakers who previously attended rallies of PKK supporters in Europe would not be allowed to visit the Konya base.